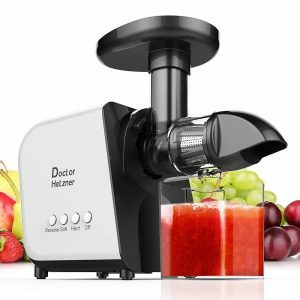 Black and white Doctor Hetzner is a 2018 release slow masticating cold press juicer with a quiet yet efficient motor. The rating for the Hetzner Juicer is 4.8 out of 5 stars by 8 customers on the day of this review, as an indication of a good deal of customer satisfaction. It is a quite a versatile juicer that can process oranges, apples, melon, leafy greens, carrots, ginger and celery. Ginger is not too hard for this machine and works perfectly with the ginger root. You can also juice things like melon, watermelon, pomegranate and grapes with seeds and you’ll only get the juice in your glass. As a masticating juicer it has an auger that pushes the produce against a metal cone filter screen. It includes the reverse function to prevent the clogging in case the ingredients get stuck along the way. As a slow masticating juicer it will maintain more of healthy the enzymes, vitamins and minerals, along with as little oxidation as possible due to very low heat accumulation and no discoloration. So you can expect great glasses of juice with very little foaming with the slow compression, and less clogging. The noise level is specified as less than 60 decibels when the juicer is on. It doesn’t require much assembly, is easy to operate, clean and maintain with the parts that are safe to be put in the dishwasher. It produces more juice in your glass, which means higher juice yield with the auger squeezing and reverse feature. The juice you get will be tasty with a rich appearance, full of flavors and healthy at the same time. It will make you consume more of the healthy stuff. 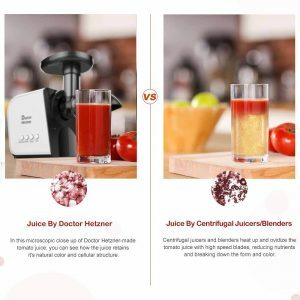 Doctor Hetzner Masticating Juicer is made of baby food grade BPA-free materials and works with the advanced technology. It weighs 8.7 pounds and measures 15.7 x 10 x 8.8 inches and with its compact size it does not take up a lot of space. You’ll get around 80% of the juice the first time you put the ingredients through. And if you put the residues in you’ll get another 20% and the pulp is very dry. It comes with a juice jug and a brush to clean after each time you juice fruits and veggies. As a CE and ETL certified product it is perfectly safe to use, it conforms with health, safety and environmental protection. You’ll get a warranty of ten years by the manufacturer and three years for the other parts. And you’ll get a decent customer support and technical help for the life of the product. It is an awesome value, budget priced masticating juicer with a very good customer satisfaction score and we don’t hesitate to recommend it. Overall you’re getting very decent value for money.